As if on cue, now that it’s October, the leaves started changing color and falling off the trees. It’s soup season! I love soup, but don’t make more than cold gazpacho over the summer. I’m excited that it’s time to put it back in the repertoire. 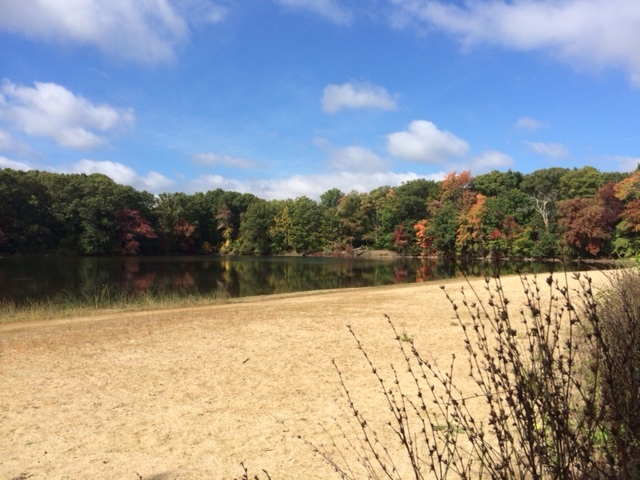 Changing colors on my walk this morning with Bella. 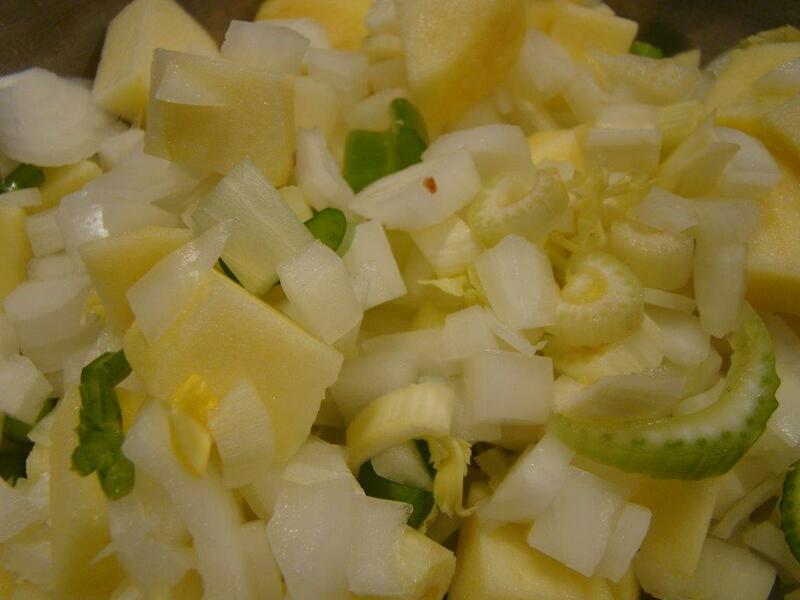 This week’s recipe for French Fridays with Dorie is for a Celery-Celery Soup. This week we start the fifth and final year of cooking through Dorie Greenspan’s book Around My French Table. We’re down to the last 30 or so recipes. I’ll admit that some of what’s left doesn’t excite me. That’s what I felt when I read through this recipe. Celery and celery root (ugliest vegetable ever) cooked with onions and apples sounded simple but boring. Wasn’t it nice to be surprised at how well this worked for me off the page. The soup itself tasted good. I liked the smooth and creamy (though cream-less) texture. It was sweet and not sweet at the same time. However, it was the extras that made this so wonderful. 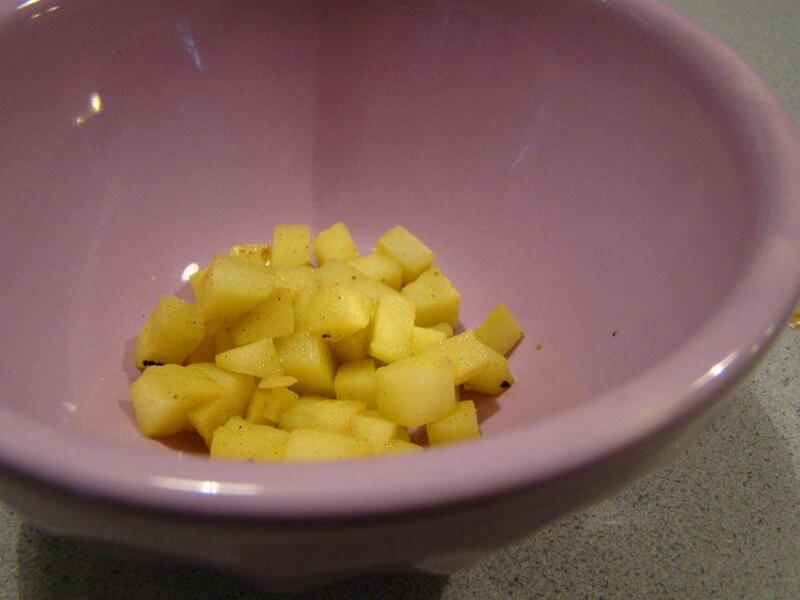 The first bonne idée was to sauté tiny apple cubes in butter and curry powder. This “garnish” hid in the bottom of the bowl, covered by the ivory-colored innocuous-looking soup. Howard was away so he didn’t try this yet. I’m not sure whether he will (apples in savory food, you know). I did give half the batch to my neighbor, would will probably enjoy it more than he would. 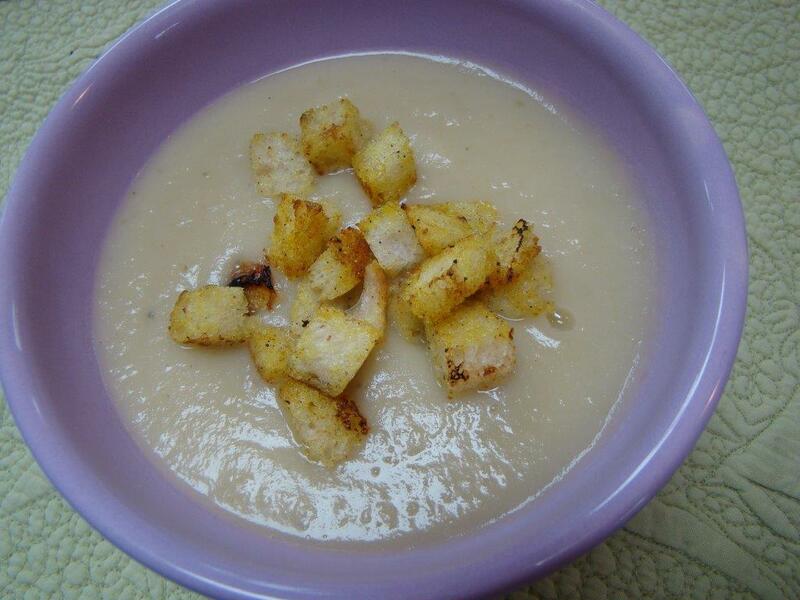 To see what the other Doristas thought of their double-celery soup, check their links here. The recipe can be found in Dorie Greenspan’s book Around My French Table or online here. We’ve been on dessert overload at home. There was the Chocolate Chip Cake I made for New Year’s Eve, which lasted through the weekend. Then, there was an apple crisp to help combat the frigid temperatures early in the week. We now have a Meyer Lemon Tart in the refrigerator to celebrate Howard’s birthday. Because I didn’t plan ahead, there wasn’t really room in the lineup for this week’s recipe for French Fridays with Dorie: baked apples filled with fruits and nuts. On top of that, baked apples isn’t something Howard eats. Fortunately, it was easy enough to make a one apple version just for me. After the indulgences of past six weeks or so of the holiday season, a baked apple is a relatively virtuous dessert. I think the recipe’s name in French sounds much more special: pommes au four (apples in the oven). And, it was so simple to make. You core the apple (melon baller works best, thanks, Diane). Then you peel the top half and score the boundary between peeled and not peeled so it doesn’t explode. The filling can be any combination of your favorite dried fruits and nuts bound together with some honey and a dash of warm spice. 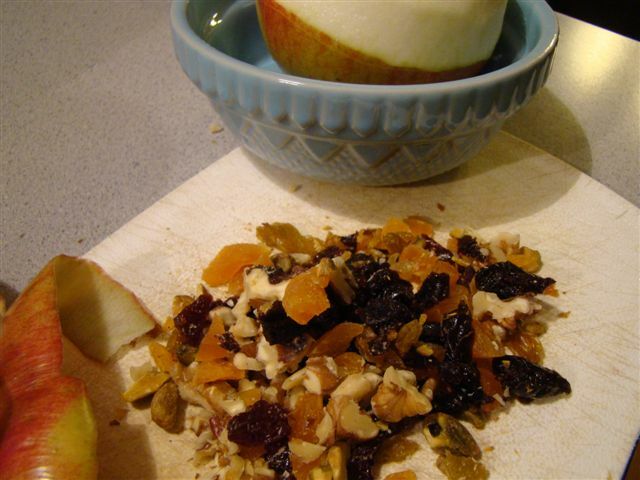 I used apricots, prune, golden raisins and cherries for fruit, walnuts and pistachios for nuts, and ginger for spice. 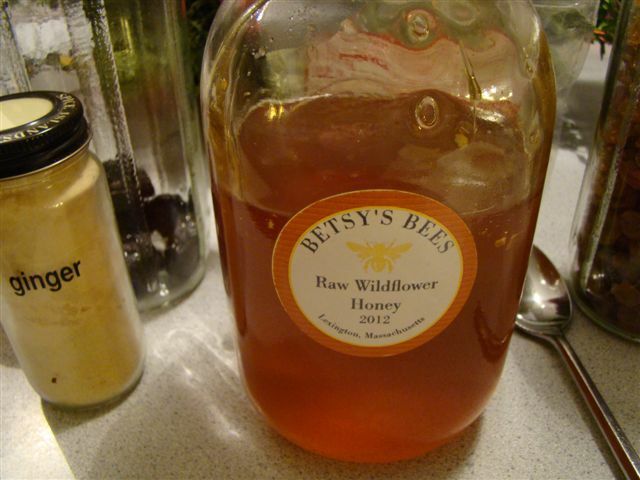 I even used a spoonful of my own honey from the 2012 harvest. To stuff, a dab of butter goes in the core followed by as much filling as will fit, then another dab of butter on top. 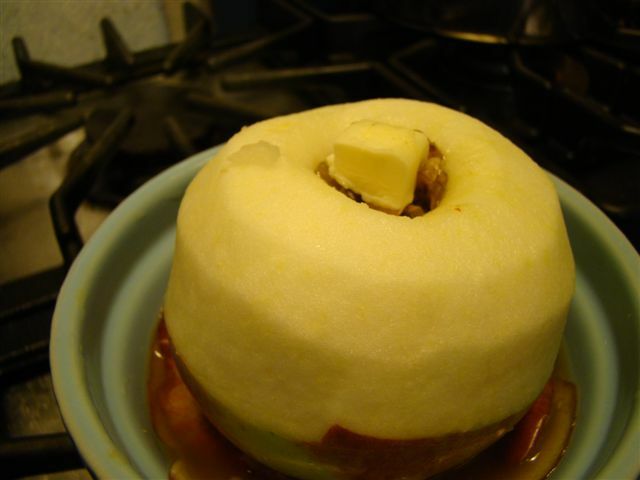 The apple bakes in a small amount of apple cider, some more butter, and the apple peelings. This liquid is used to baste the apple while it’s baking. I ended up eating my lone apple cold for breakfast (see wide array of desserts above) topped with warmed juices. I can’t remember ever making or eating baked apples before, though the taste reminded me of so many apple desserts I’ve had. I liked it, but I’m not sure I’d bother making it just for myself again. So, this might be a one-hit wonder. I don’t have much else to say today. I hope you are staying warm where you and that the weather is treating you gently. Happy Friday! 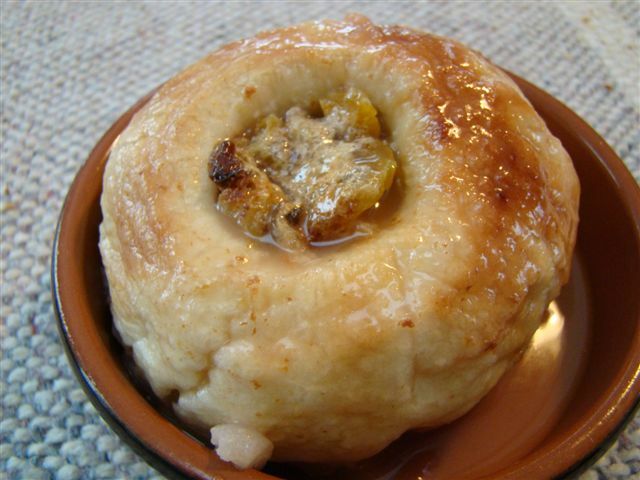 You can find the recipe on-line here. As always, the recipe is also in the most-used recipe on my shelf, Dorie Greenspan’s book Around My French Table. To see the combinations my Dorista friends used, check out their links here..